This single barre ballet bracket is manufactured by DuroBarre Manufacturing. The surface is powder coated with antique bronzed texture. It fits aesthetically in any studio or home. All the corners are rounded to give a smooth and subtle appearance to blend into the surrounding. It is very sturdy and built with quality in mind. We offer 3 years warranty behind our work. The 3" bracket is designed for connecting two barre. 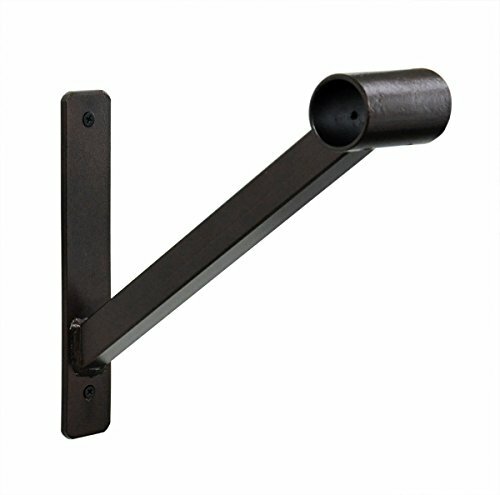 This listing is for ONE bracket only; You must have minimum of 2 brackets to support a barre. This bracket will fit wooden barre/dowel that is approximately 1-3/8" in diameter (this is the standard ballet barre diameter). The wooden barre/dowel is a standard closet pole that is readily available at Home Depot or Lowes. -All holes are countersink so the screw bolt head is not protruded. If you have any questions about this product by Ballet Central, contact us by completing and submitting the form below. If you are looking for a specif part number, please include it with your message.